Clarice hated contests of all kinds so everyone who knew her was shocked when she announced she had put her name in the hat for the local radio contest. Twenty-one weeks of clues and there were four contestants left. The clues had all been historical facts about Ira Township and her family had lived here for generations. She knew nearly everything about the area and what she didn’t know, could be found in the trunks in her attic. She hoarded and protected those secrets. They would have their uses. For now, she just examined the good people of this town with new eyes – eyes that knew what was behind the nuances and alliances. Delicious stuff. The only other contestant that worried her was Brent Carmichael. He had lived here all of his life too. The prize was the old Vernier house and she wanted that house more than anything she had ever wanted in her life. Not because it was a great house. It was a monstrosity. It was old and not in a good way. It was badly in need of costly repairs and some New Age nut cases had gotten a hold of it for awhile and done bizarre things with paint. The house held a secret. She was pretty sure that she and Brent were the only people alive who knew about it and if Brent won, the secret would never be told, because it was about his family. He had always bragged about the Carmichaels, so uppity like they were something special because some of his ancestors had been among the founding fathers of the township. 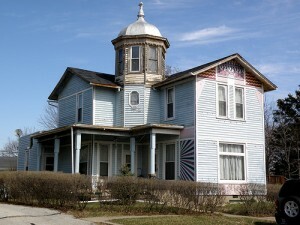 The Vernier house had originally been built by Zachary Carmichael and it had been in the family until old man Vernier bought it back in 1951. Clarice stopped in at Mabels and ordered a cup of coffee and a cinnamon roll. She had barely gotten her cream stirred in when in walked Brent. He nodded at her and she nodded back, fuming. There went her appetite. She held up a finger at Lorraine and the waitress brought her the check. She left cash enough for her bill and a tip sitting on the table and draped her pashmina around herself, grabbing up her newspaper and strode out the door. It was one hour until the last clue would be given out on the radio and she wanted to be near her research and a phone. She spared one last grimace for Brent as he nearly got choked on his coffee when he looked up and saw her looking at him. She smiled inside thinking about how he would look if he truly was choking. She started her car and drove home, hitting the garage opener and parking inside. She settled with her trunks and her cell phone on the cushions she had drug up to the attic and waited for the radio station to broadcast the last clue. The intro music played and the broadcaster welcomed everyone back to the final round of the Ira Township History Contest. Clarice fidgeted with her phone, wishing the imbecile would quit dragging out the excitement and get to the clue. She listened and hit the speed dial button on her phone. She didn’t even have to look this one up. She was the first caller! She rapidly gave the answer and goofy horns and bells and whistled hit her double, from the phone and the radio which she quickly lowered the volume on. She had done it! The house would be hers! She made arrangements with the station to meet them the next day for promo shots of her taking the key to the house and poured herself a glass of champagne from the bottle she had bought, anticipating the ending. Too bad she couldn’t see Brent’s face right now. That was the only thing that could make this sweeter. Her cell rang and she knew the number that showed up on her screen. She answered sweetly. “Hello, Brent! Calling to congratulate me?” She smiled and did a little dance as she waited for his answer. “I should kill you for this Clarice.” Void of the usual sarcasm, his voice sounded tired and sad. “Brent, dear, I’m counting on it!” She clicked end on her phone and spun around laughing. This was just too wonderful. She remembered every slight. Every time Brent and his family had treated her like dirt, like she wasn’t good enough for them, just because of the divorce. The story was that her grandmother had been divorced by Brent’s Grandfather because she had an affair. Clarice knew the truth. The next day she dressed with care and drove to the old Vernier house. The Newspaper and Radio people were already there. The bright yellow van with CKLW The Sound of the Motor City painted on the side was parked across the street and the guy from the radio was chatting with Mr. Hornberger from the Blue Water Weekend, a little weekly rag that was more ads than news. Clarice checked her hair and make-up in the mirror and got out of her car, noticing Brent’s car parked down the block. She gave a little wave and walked over to the Radio van. “Gentlemen? Let’s get this show on the road!” Clarice was excited about the hoopla, but the big prize was after everyone left and she had the house to herself. She had brought supplies with her so she wouldn’t even have to go home. A pair of jeans, work gloves, sledge hammer, and a nice picnic basket of treats for celebrating. The obligatory interview and pictures of her with the radio station president handing over the key as they both posed for the camera were out of the way. She shook hands with everyone, smiling and bobbing and thanking them repeatedly. All she could think about was being alone and getting in that house. She smiled and waved as they drove off. Time to unload the car and get to it! She hauled everything inside and changed into work clothing. Clarice wasn’t sure how much trouble it was going to be but she was prepared. She carried her tools and a lantern down the creaky basement steps and looked around. There was a little light coming through the basement windows. The basement was completely empty, a little dusty from sitting there for years with no one living here. The last residents had cleaned it o ut. She started walking around the basement, knocking on the walls and listening for a hollow sound. When she had found the spot she was looking for, she got her sledge hammer and hoisted it up. She let loose on the wall and a hole appeared with spider web cracks branching out around it. The stupid hammer weighed a ton and she could barely lift it but once she got it moving, the weight carried it the rest of the way. In a short time she had made a person sized hole in the wall. She could see something in there but she held back, not allowing herself to look until she could clean out the debris and get in there with the lantern. It was there! The skeleton of the Indian woman old Zach had taken as a common law wife after he divorced her grandmother. Along with the pile of bones was the necklace her grandmother had described in her journal and the original deed to the land that would become the town. Here was all the proof she needed that old Zach had forced the woman to sign the paper and then killed her and walled over the proof! She took pictures and stuck the camera in her jacket pocket. Taking the wall down had been hard work. She went upstairs to get her picnic basket and went back down to the basement to celebrate in front of her prize. Next city council meeting, Brent would resign, citing health issues and she would step in. She had other secrets to use. Mr. high and mighty mayor who had been the town pharmacist for years had been getting a little too touchy feely with the young girls that came in the store. Everyone felt sorry for him because his wife had been ill as long as anyone could remember. Maybe he was the one making her ill. Old Ed Borowski had also opposed her being on the council. Everyone respected Ed. He had the contracts for all the major construction in the county. There were a few “skeletons” in his basement too. She smiled at that thought. They were all in for a surprise. She was lost in her thoughts, munching her egg salad sandwich and didn’t hear the sound of the hammer swishing down at her head until it was too late. Brent drug her body in behind the partial wall and sat down to finish her meal. Building that wall back was going to be an all night job but it would be worth it. There would be a bit of a stir when people realized Clarice was missing but it would blow over. Maybe he would suggest they condemn this place at the next city council meeting. This entry was posted in One Word, Prompted To Write, Sunday Scribbling, The Pen on December 29, 2009 by Dee. I ignored everything I had started and took a stroll through my roots of small towns and their small minds and nasty secrets and how much time and effort they give to keeping their little secrets that everyone knows anyway 🙂 Thanks for coming by and for petting my whiny little self. I am still blown away by that piece..
Law of Dee dictates that Clarice was gonna pay for that easy win. Given your recent struggles, I’m guessing Brent’s hammer came down on a few other things in your head, knocked loose the sheet rock that was troubling you. I’d say Mishigama is offering up some mighty rich loam for you these days, all these wonderful, sure touches – you’ve breathed this air, and it’s breathing for us now. The end seemed a bit of a screech for me, though I knew it was coming, but then again, these pieces have to end somewhere. This has the makings of yet another long piece to go with the rest of your bevy, and it’s a whole ‘nuther landscape for you to play in. Well worth waiting for! Silly of Clarice not to realize that the pillars of the community always win… because they will stop at nothing. I fully expected her murder, but putting her in the wall was a surprise and brought the whole thing full circle in a deliciously macabre way. Your story was delicious. I knew what the end would be, because you delivered the scent of it in increasingly pungent wafts with every paragraph, but that didn’t stop me from finishing it.